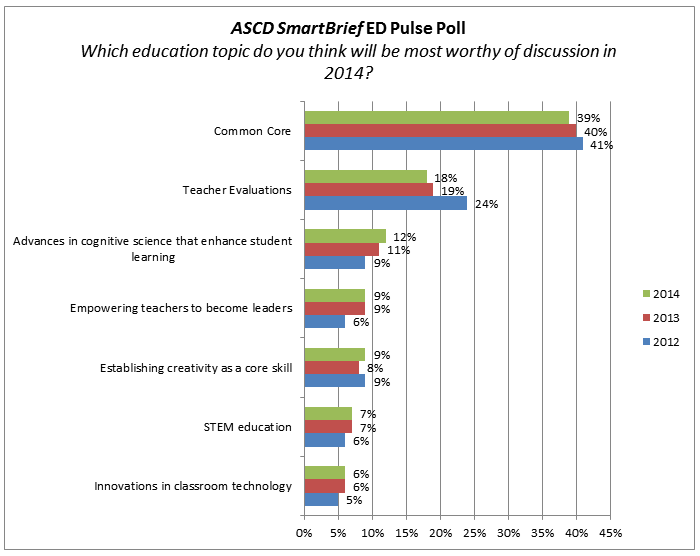 As we have done in past few years, the last ASCD SmartBrief ED Pulse poll of the year ended with a prediction question. We asked the same question at the end of 2012 and 2013. The results from all three years are shown below. As can be seen, the results are fairly consistent. Common Core State Standards remain the key topic of conversation (near 40 percent in all waves of the ED Pulse poll) and continue to be important to educators in other research studies recently conducted. This was followed by teacher evaluations, mentioned by about 20 percent of the respondents, which also remained similar to last year's rating. All other topics remained at the level they achieved last year. This survey question was included in ASCD SmartBrief, a free daily e-mail news service that provides summaries and links to major education stories and issues that has more than 200,000 subscribers. Using ED Pulse, the weekly online poll, data was collected from 569 readers, starting on December 19, 2013. Online surveys do not provide a random sample, as participants are self-selected, meaning that a margin of sampling error cannot be calculated or quoted. In addition, the population and sample are limited to those with access to computers and an online network. However, online surveys have been shown to produce results that have proven to be reliable predictors of outcomes, including election results. If you have a question on education that you would like to see addressed in a future ED Pulse poll, feel free to submit it in the comment section below, along with any other comments.